It was August 1, 2003: the country was still mourning the loss of the space shuttle Columbia, which had disintegrated upon re-entering Earth’s atmosphere six months earlier and the Black Eyed Peas’ “Where is the Love?” topped the radio charts. What’s the significance of August 1? A man by the name of Tom Anderson had just founded MySpace, which would grow to be the largest social networking site in the world in 2004. It would also largely change the way we use the internet, ensuring that cataloging and communicating with friends became one of the top uses of the web. Here’s our look at shopping on social media — and how long before the industry really nails it. Leading the charge is Instagram, which alone influences 72% of its users’ purchase decisions — not to mention the platform’s influencers, which are used by 70% of brands and retailers. Part of the reason for social media’s success, according to Davis-Felner, is how visual the platforms are, which has driven social media to become more of a “third channel” of sorts, behind e-commerce and brick and mortar. “Even when you’re talking about a brand-promoted post, there is a level of authenticity in social posts, and the good brands use that and amplify consumer voice in their social postings in a way that makes them more relatable and more trustworthy,” Davis-Felner said, noting that visual content on social media is also playing a huge role in conversions. When it comes to actually convincing a shopper to buy something on social media, though, consumer or user-generated content is the “holy grail” for retailers, according to Katherine Hays, CEO of consumer-sharing firm Vivoom. 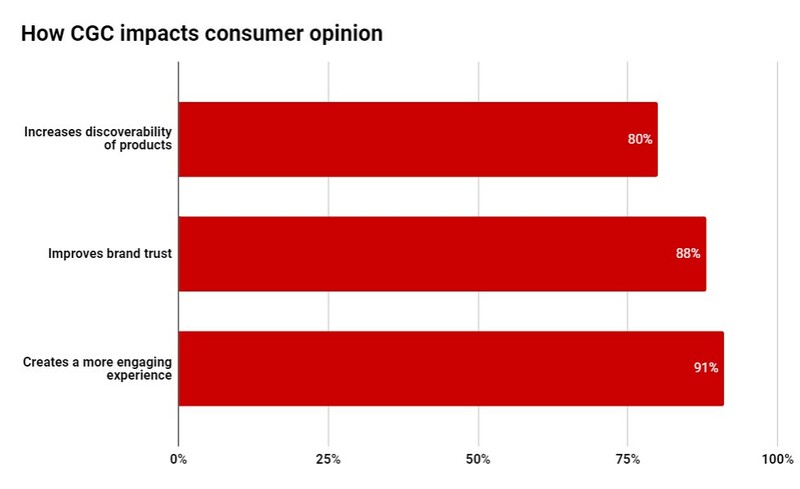 Bazaarvoice’s findings mirror that, as over 80% of consumers reported that CGC increases product discoverability, improves brand trust and creates a more engaging experience, while 56% say that seeing product ratings, social media pictures and other consumer-generated content is important. “It’s trusted, it’s watched, it has incredibly high click-through rates, but traditional [CGC] isn’t always brand-safe, it doesn’t have high quality all the time, and there’s not scale,” Vivoom’s Hays said. Brands she’s worked with have seen positive results from initiating user-generated content themselves — something Vivoom preaches, Hays noted. Lily Pulitzer, for one, saw a 12% click-through rate on videos that they asked customers to create and share on social, with an average spend of $108.39. Other retailers, like Warby Parker, have also been wildly successful with social media campaigns, including Warby’s now-famous push for customers to share photos of themselves in their glasses and get a friend’s opinion before making a final decision. In fact, the retailer’s last funding round this March was its fifth, according to Crunchbase, and the company is now valued at $1.75 billion. While user-generated content might be the holy grail of social media, social shopping hasn’t reached the same status for retailers. Not only is there a disparity between which generations use social channels (and are willing to buy from them), but the younger generations also have less disposable income than their older counterparts. That creates all kinds of difficulties for retailers, including which social channels to turn to (Facebook’s older demographic versus Snapchat’s hyper-young audience) and whether or not to tailor entire marketing strategies around a consumer group that, as of yet, can’t afford a whole lot, according to Jon Reily, vice president of global commerce at SapientRazorfish. In addition to being a “wild west” to monetize, Reily points to convenience as a serious roadblock to the success of social shopping. While retailers like Victoria’s Secret and eBay have dabbled with shoppable content, the act of physically buying something on social hasn’t gotten much easier. So far, Instagram is the only platform that’s really meeting that expectation, according to Reily, and even then — it’s not pretty, as evidenced by the adoption numbers. Bazaarvoice’s data shows that 68% of shoppers stress an easy-to-use mobile experience as important to the online shopping process, and even among heavy online shoppers, only 19% have ever purchased from a social media platform — evidence that the process isn’t as smooth as it could be. While retailers have slowly adapted to bringing social content into product pages, bringing shopping into social channels is “still emerging,” according to Davis-Felner, and most social purchases come from limited-edition products or spur-of-the-moment discoveries — in other words, without regularity. “Social media is about discovery and serendipity and experiences that have nothing to do at all with paper towels,” Davis-Felner said, emphasizing the limited scope of social media shopping in its current form. Right now, social media’s track record is pointing in favor of the latter, but that doesn’t mean the platform won’t gain more traction in the coming years. The traction it does gain, though, might be targeted toward a particular type of limited-edition product, a la Nike’s Air Jordan Snapchat move. These “manufactured spikes,” as Reily calls them, are the only real success stories on social media right now, and the channel is likely to continue along the same lines until Gen Z and the younger millennials have a chance to grow up (and grow their income accordingly). Even then, though, the chances of social media becoming a go-to platform for household commodities like detergent and toilet paper is slim. “Anything that’s actually replenishable, I don’t think ever will be sold on social media,” Reily said, “And in fact, I see that moving out of the spectrum of something that you consider at all.” He expects items like this to be more automatic in the future, similar to Amazon’s dash buttons and Walmart’s Easy Reorder feature. There have been murmurings throughout the industry of retail-specific social media feeds, with Amazon testing out its own platform, “Spark,” in July, but so far they haven’t changed much about the way consumers shop on social. And as appealing as the idea doubtless is to retailers, it’s unlikely that shoppers will take to social platforms made purely to sell one retailer’s products. “I think it’s a big leap,” Hays said, noting that retailers shouldn’t need to create their own social platforms to reap the benefits of social shopping. Although retailer-specific social media platforms aren’t on the horizon just yet, social shopping is still top-of-mind for customers and retailers alike. In fact, Bazaarvoice found that integrating social media and online shopping was a priority for 81% of brands, 47% of brands and retailers thought being able to buy products from social media would be important to shoppers in 2018, and 23% qualify that capability as a “significant differentiator” in the next year. Then there’s the voice hiccup. Social commerce is developing at a time when voice commerce is coming into its own, with Amazon controlling the majority of the market share and shoppers slowly getting used to the ideaof making purchases with a few choice words to an electronic device. The interaction between those two platforms isn’t clear yet and, according to Reily, it all hinges on who gets the upper hand in the market: Amazon, Facebook, Google or Apple. Depending on which giant is successful, we could be seeing a voice assistant world dominated by more social functions or Amazon’s preferred shopping-heavy platform, which will impact the way social commerce develops, as well.